Her Campus, an online community for female college students, is looking to engage more undergrads during its third-annual College Fashion Week in October by partnering with TRESemmé. Her Campus, an online community for female college students, is looking to engage more undergrads during its third-annual College Fashion Week in October by partnering with TRESemmé. Events will be in Boston, New York, Chicago, and San Francisco. In 2013, Her Campus held shows in San Diego, Alabama, Florida, and an off-campus location in Boston. After seeing the latter show’s success, the brand decided to do all off-campus events this year. In 2013, Her Campus had 2,500 attendees from more than 120 colleges. The program this year plans to be bigger in scale. "It was a natural extension to sponsor College Fashion Week and bring style to the masses while speaking to young people who are transitioning into the post-collegiate and professional world," says Jen Daly, senior brand building manager for TRESemmé at Unilever. The brand will have styling bars at the shows where attendees have their hair done and get professional headshots taken. Daly says TRESemmé is giving students the "resources and tools to help them define their personal style." TRESemmé is working with Siren PR for media outreach, while Her Campus is handling communications internally. 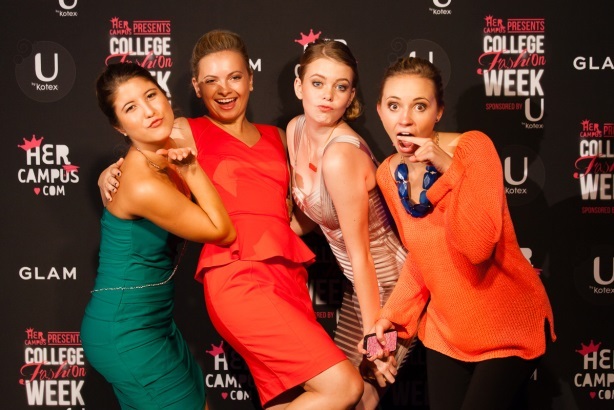 Her Campus launched the website CollegeFashionWeek.com to provide event details and links to the show’s social platforms. In 2013 there was 654% more engagement on College Fashion Week-related Instagrams than typical sponsored Instagrams, and 403% more engagement on event-related Pinterest posts than on sponsored pins. In New York, Her Campus is sending VIP invitations to fashion bloggers and journalists from publications such as Cosmopolitan, Seventeen, Glamour, and Self. Her Campus also has a partnership with Teen Vogue, where the community’s bloggers will cover the events.